IT administrators sometimes will have to import email files (of their employees) to the organization’s email servers – Exchange Server, IBM Domino, Novell GroupWise, or Office 365. This situation usually arises when employees work from home on their own systems. It is easy to import the files of the email clients supported by the email server – e.g., importing Outlook PST files to Exchange Server. However, importing MBOX files (of email clients like Thunderbird) to Exchange Server or other email clients is difficult. For that, administrators will have to use professional tools like Kernel for MBOX to PST. Kernel for MBOX to PST, apart from converting MBOX to PST, migrates your MBOX file to Exchange, Domino, GroupWise, or Office365. Another advantage of this tool is that it facilitates selective migration (migration of specific items) of MBOX data with the help of its email filters. It has many advanced features as well. How to save MBOX emails to Exchange, GroupWise, Domino, or Office 365? 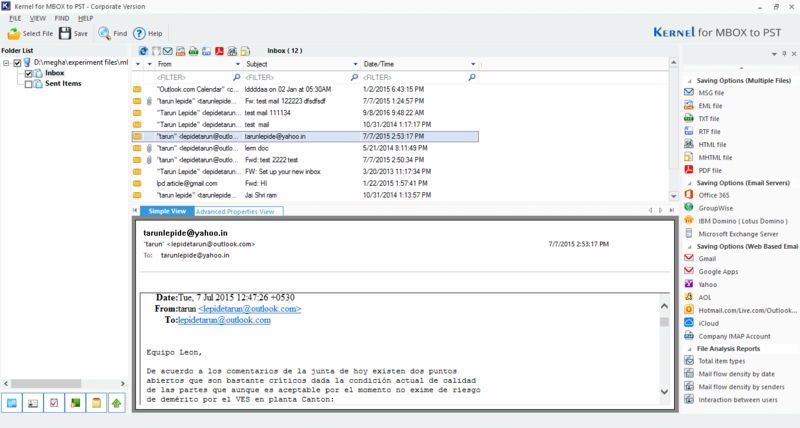 It is easy to use Kernel for MBOX to PST to save MBOX data to email servers and Office 365. Before starting the migration, make sure that you have the login credentials of the email server (Exchange Server/Domino/GroupWise) or Office365. STEP 1) Open Kernel for MBOX to PST. To add MBOX files for migration, click Select File. STEP 2) Click Browse and select the folder containing MBOX files. After the selection, click Finish. STEP 3) Your mailbox folders will get opened in a tree-like structure on the left pane. Select the required folder on the left. Select the required MBOX item in the upper-right pane to preview its content. 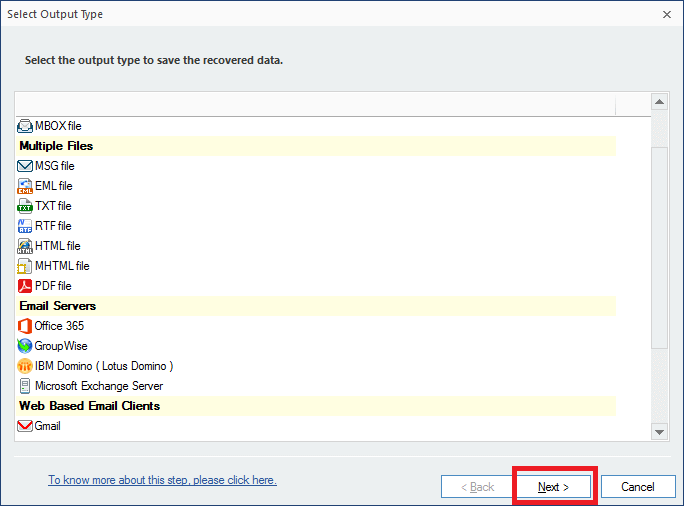 STEP 4) Select the required folders to migrate and click the Save. STEP 5) In the Select Output Type dialogue box, select the required destination. To save to Office 365, select Office 365. To save to Novell GroupWise, select GroupWise. To save to Domino, select IBM Domino (Lotus Domino). STEP 6) Select filter(s) dialogue box is opened. 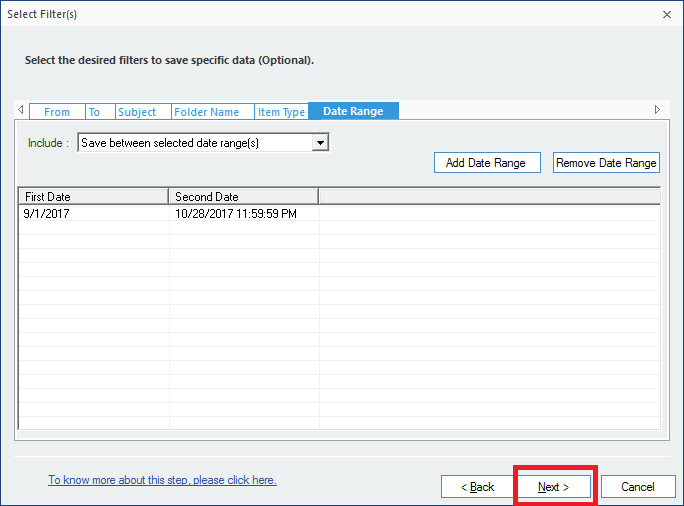 Apply filters for quick selection (an example of Date Range filter application is shown below). 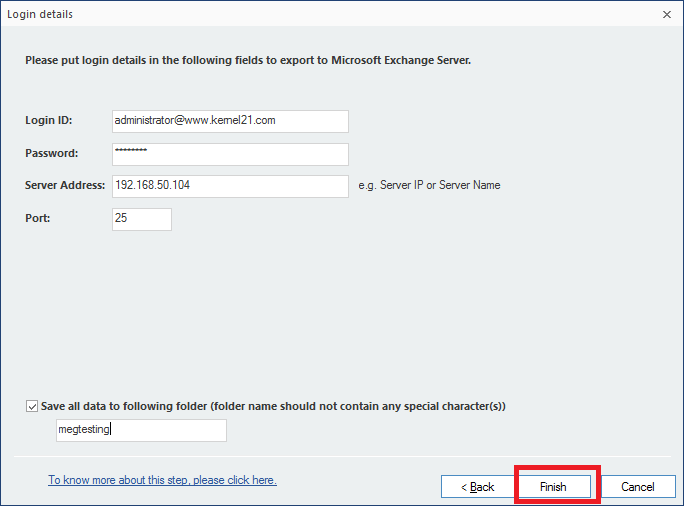 Step 7) In the Login details dialogue box, provide Exchange Server login details (you have an option to save the files to a specific folder. For this, select the checkbox and provide the folder name). Click Finish. After the completion of the saving process, the software displays a confirmation message. You can use Kernel for MBOX to PST to save your MBOX files to Office 365, IBM Domino and GroupWise. The procedure is same. 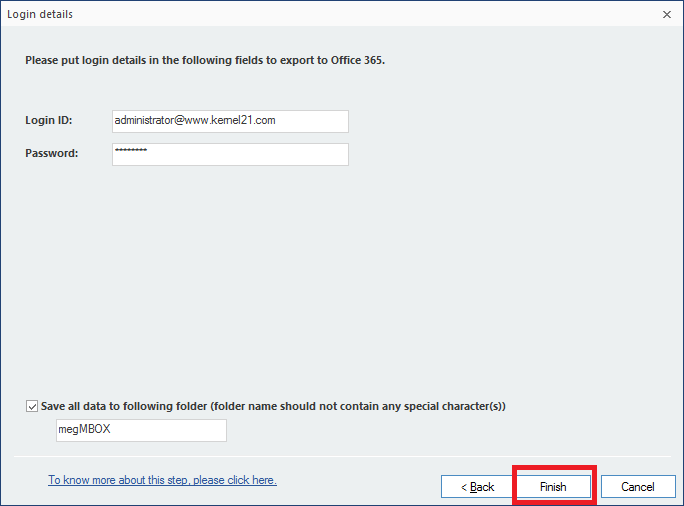 The Login details page of Office 365 is shown as an example. 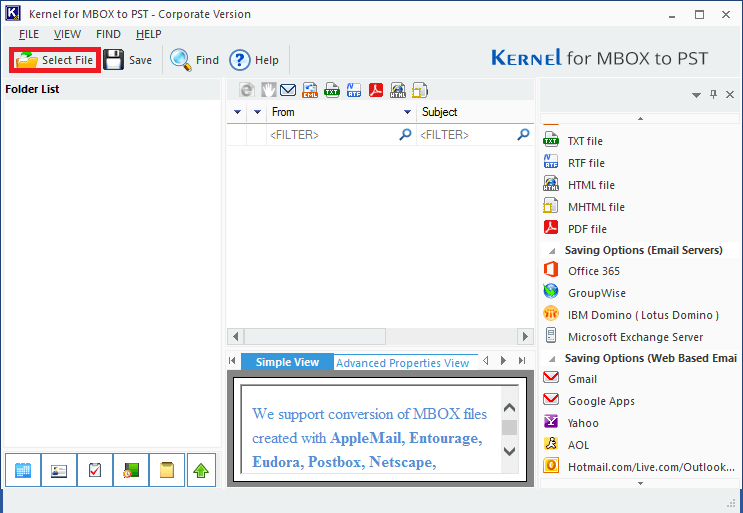 Kernel for MBOX to PST Converter migrates MBOX files to popular email servers and Office 365. The tool, wih its user-friendly interface, helps to migrate MBOX files to the required destination easily. I would like to know can this software able to convert 30GB mails from Thunderbird to Outlook pst? 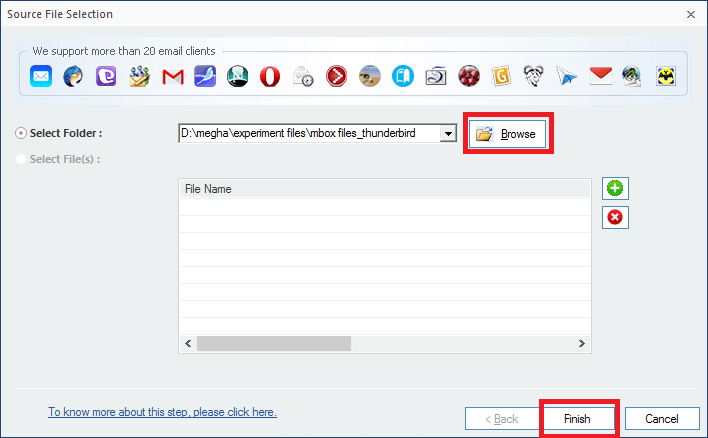 you can convert 30GB size mailbox from Thunderbird to Outlook pst. To know more about features please visit MBOX to PST product page. Can the MBOX to PST software read multiple folders at one time and make into a single PST file? Yes, Kernel for MBOX to PST converter read multiple folders at one time and convert into a single outlook PST file. Also tool converts MBOX to office 365 cloud. 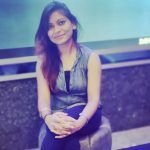 I am looking for native ways to move my Thunderbird emails to Exchange or Office 365. Can anybody help? I am afraid no such methods are there. You should try third-party MBOX to PST converter tools for this.